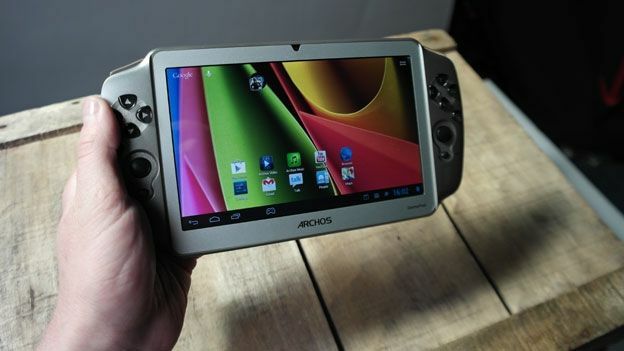 The Archos GamePad is a 7-inch Android handheld console that holds a lot of promise. Is it a decent affordable alternative to the PS Vita? 2013 is set to be the year that Android gaming breaks free from smartphones and tablets with Ouya, GameStick and Nvidia Project Shield amongst the Google-powered consoles hoping to challenge the Xbox 360, Sony PS3, Nintendo Wii U and possible next generation offerings from Microsoft and Sony. The Archos GamePad, announced last year, is a 7-inch handheld console that lets you play games from the Google Play store with physical buttons and analogue sticks instead of those frustrating virtual controls and carries hopes of offering an more affordable alternative to the PS Vita and the Nintendo 3DS. The French company claimed “tablets provided gamers with touch controls that lacked response and compatibility, providing a disappointing gaming experience.” So does the GamePad have what it takes to be named in the same breath as Sony and Nintendo? Here's what we made of the Android handheld. Essentially a 7-inch tablet with physical controls bolted on the GamePad weighs in at 330g which is around 10g lighter than the Nexus 7 Android tablet and with a plastic design doesn't feel as polished as something like the ASUS built slate but it is lightweight and comfortable enough to play games for a long period of time. In terms of the buttons from the left of the screen you'll find the D-Pad with an L2 button below, analogue stick which feels like the ones that were used on the first Sony PSP, a Select button with a stereo speaker. On the right there's the X,Y,B,A diamond formation of buttons with R2 button, analogue stick, start button and the other stereo speaker. On the top of the device is a pair of clear plastic shoulder buttons, with a volume rocker, standby button, USB port, headphone jack and micro HDMI above the screen. The micro SD card slot is well hidden on the bottom of the device. The 7-inch capacitive display is capable of 1024 x 600 resolution which is the same screen quality as the Amazon Kindle Fire which was itself was underwhelming and considering the screen quality of Android tablets this size is disappointing. With 170ppi it lacks real vibrancy and colour for watching videos and browsing but it manages to do a decent job of showing games. Running on Android 4.1 Jelly Bean it feels different to what we've seen on the Nexus and Samsung devices but perhaps that has something to do with the cheap feel of the hardware and screen. Essentially it has all the same homescreen buttons with added mapping button icon on the bottom launch bar, which is the GamePad's main special trick. When you select this, a small menu is brought up on the centre of the screen where you can drag a button, control stick or target stick onto the screen and click on one of the physical buttons to assign to it. The ARM Coretex dualcore processor running at 1.6GHz with 1GB of RAM is decent while the Mali-400 quadcore GPU is the key to running graphically demanding games effortlessly with smooth frame rates and minimal lag. With no 3G or 4G capabilities, you'll rely on Wi-Fi to download games, browse and other typical tablet features and there's only a front-facing camera to video chat. 'Thousands of games compatible thanks to the EXCLUSIVE ARCHOS mapping tool' is the claim on the box. However, when we tried to download games on Google Play that would benefit greatly from physical controls, like GTA: Vice City and Max Payne we were met with a 'this game is not compatible message' which is where the the GamePad begins to unravel. Thankfully, we were able to download big titles like FIFA 13 and the likes of Dead Trigger and N.O.V.A 3. When we booted up Dead Trigger and N.O.V.A 3 the 'GamePad button emulation is running' message flashed up at the bottom of the screen which we assumed meant that the physical controls would automatically configure to the virtual ones but that was not the case. Instead we had to open the mapping feature and do it ourselves. The problem here is having to assign buttons while the game is running which is far from ideal. Once buttons have been mapped manually the problem continues with the physical hardware itself. The analogue thumbsticks are stiff and far from responsive and make it a jarred experience playing a FPS on the GamePad. When we tried swapping the analogue controls for the D-Pad we had real issues simply trying to map them as well. The issues continued to surface as games were constantly freezing or simply not reacting to the mapped controls which began to really test our patience. We're glad that there's microSD card support up to 32GB because after installing eight games, which included some particularly data heavy titles from Gameloft, we had already reached critical storage space. To add further insult to injury the GamePad only lasts around three hours on full charge which, compared to other Android tablets, let alone the 3DS and Vita, is pretty underwhelming even for a device that's less than £150. The Archos GamePad had so much going for it. The affordable price, a design well suited for handheld gaming and great TV mode support but there are just too many issues with it. The game compatibility issues along with the manic mapping situation for many games and some awful analogue sticks means it's a major let down overall. We posed the question as to whether it was a PS Vita or 3DS challenger and we can emphatically say that ithe answer is a big 'no' for the Archos GamePad.